The RZR XP® 1000 sets the benchmark for Xtreme Performance on all terrain, but the Trails and Rocks Edition delivers added capability. 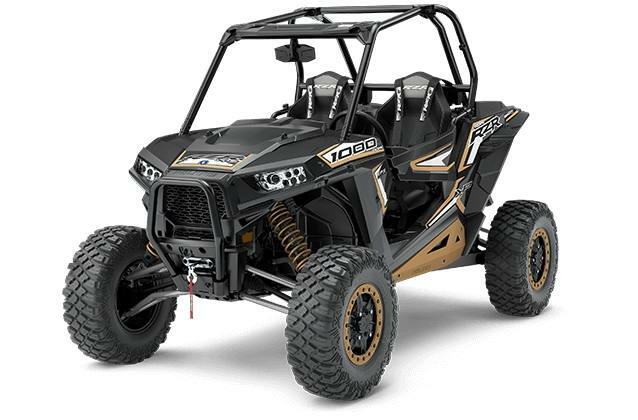 Specially engineered from the inside out, this RZR delivers first of its kind features to take on the twisting trails and conquer the rugged rock piles without compromising the legendary RZR XP 1000 performance. All-new 55% Lower gearing in Low optimizes the crawling grunt. All-new Gated Shifter lets you go from High gear to Reverse and back. All-new low speed throttle map for more low speed control. Glide over whoops, rocks, obstacles, and mother nature's most challenging terrain with our standard-setting suspension. Offering a huge 18-inches of rear wheel travel and 16-inches of front suspension travel thanks to our race-inspired 3-link trailing arm rear suspension and industry exclusive Walker Evans Needle Shocks for near bottomless, next level performance. And the Trails and Rocks Edition's High Clearance Lower A-Arms and Rear Radius Rods are stock, giving you 14 inches of ground clearance to keep you riding high above the trail's obstacles. The Trails and Rocks Edition delivers all the adjustability, comfort, and storage of the RZR XP 1000, but also features added capability for the driver and passenger. See where your buddies are with a rear view mirror and see more of the rocks and trail ahead with the high visibility front fender flairs. Also, stay comfortable and secure with the premium Click-6 harnesses. All of that Power and Suspension demands agile handling, and the RZR XP 1000 Trails and Rocks Edition delivers with the fastest engaging AWD in the industry. The Trails and Rocks Edition comes standard with premium accessories straight from the factory, but you can take communication to another level with the Comlink RTX VHF Radio and Intercom by Polaris. Perfect for communicating during technical rock crawling and group trail rides.